Cerita semangka emas dalam bahasa inggris berikut mengandung banyak pesan moral yang disampaikan dalam bentuk dua karakter utama yaitu Dermawan dan Muzakir. Kedua orang tersebut memiliki sifat yang bertolak belakang. Dermawan adalah orang yang baik hati dan suka menolong, sedangkan Muzakir memiliki sifat pelit dan kikir. Hingga akhirnya mereka mendapat imbalan dari semua perbuatan mereka melalui bibit semangka yang dibawa oleh seekor burung. Dermawan mendapat bibit semangka emas karena kebaikan hatinya, sedangkan Muzakir memperoleh semangka berisi lumpur hitam yang bau karena sifatnya yang kikir. berikut adalah salah satu cerita rakyat budaya nusantara dengan judul Semangka Emas. Long time ago, at the north area of West Kalimantan, lived a wealthy merchant. He had two sons. The older one is named Muzakir and the younger one is named Dermawan. The two brothers were so different in their attitudes. Muzakir had a very mean and greedy character. On the contradictory, Dermawan was a caring and kind person. He was not greedy and always tried to help those in needs. Before he passed away, the merchant divided all of his money equally to both of his sons. He did it so that both of his sons will not envious at each other. Muzakir then bought a big cash-box. He put his entire share inside the cash-box and locked it. When a poor came to Muzakir’s house, he laughs at them instead of giving them something. If the poor don’t want to leave, Muzakir would summon his servants to chase them away. Many of the poor in that area had heard about Muzakir’s rude attitude, therefore they preferred to come to Dermawan. When Dermawan saw those peoples coming, he sincerely welcome them to his house and shared money with those who needed it. It was almost every day a poor came for his help that f inally he ran out of money. Dermawan then moved to a smaller house. He also worked as a foreman. His salary was not much, only enough to buy his own daily meals. 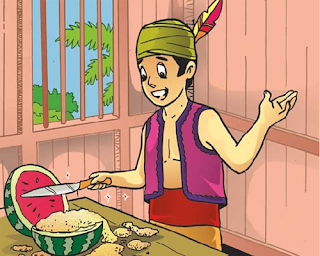 But Dermawan was happy with his simple life. His elder brother laughed when he heard the news about Dermawan. He always thought that Dermawan was a fool to share his money with other people. He himself has just bought a large new house. “There is no one who as stupid as my younger brother,” he said. One day, when Dermawan was sitting and relaxing in his house yard, a sparrow suddenly fell off in front of him. The sparrow twittered in pain. “Poor bird, did you broke your wing?” He took the bird and examines its wings. He’s right. One of the sparrow’s wings is broken. “Let me take care of you,” he said. Dermawan bandaged the sparrow’s wing and then he took some rice to feed the poor bird. After some time, the bird gradually tamed and was no longer afraid to Dermawan. Few days later, its wings were completely healed. After a while, it flew to the sky. The following day, the sparrow came to visit Dermawan. It held a seed with its beak, and then it put the seed in front of Dermawan. It was an ordinary seed, but Dermawan accepted it with a big smile on his face. He then planted the seed in the back yard of his house. Three days later, the seed started to grow. It was a watermelon tree. Dermawan took good care of the tree. He thought the tree would bear many fruits since it was so blossomy. But, from all the flowers, only one turned to fruit. Day by day, the fruit grows bigger, bigger than any watermelon Dermawan ever see. Harvesting time finally came and he decided to take the watermelon. “Oh my God, it is so heavy”, he uttered while trying hardly to carry it into the house to put on the table. He took a knife and started to cut the watermelon. Dermawan was shocked. Inside the watermelon is some kind of yellow sand. “What could this be?” Dermawan wondered. Then he realized that the strange yellow sand was actually a pile of pure golden sand. “Holy God, it’s gold. I’m rich,” he danced happily. He heard bird twittered and he looked outside. He saw the sparrow on a tree. “Thank you”, he shouted. “Thank you”, he shouted again, and then the sparrow flew away. Dermawan then bought a big house with a very big garden the next day. All of the poor came to his house and were welcomed for meals. This time, Dermawan would not run out of money. He had so much money, and his fields produced plants with good fruits as well. The news about Dermawan’s fortune was heard by Muzakir and made him envy. He went to Dermawan house, and Dermawan honestly told his brother about the sparrow. Muzakir immediately commanded his servants to find a bird with broken wings as he heard the story from his brother. A week passed, but Muzakir’s servants still couldn’t find such bird. He was so angry and even couldn‘t sleep during the nights. The next day, he asked one of his servants to catch a bird using chopsticks. Of course, the chopsticks hurt the bird and broke its wings. Muzakir then pretended to pity the bird and took care of it. Days passed and the bird was completely healed and let to fly. The following day, the bird came back to Muzakir and brought a seed for him. He was very happy. ”I will be very rich soon, even richer than Dermawan,” he said to himself. Cerita Rakyat merupakan sarana untuk mejaga eksistensi budaya bangsa agar tidak hilang ditelan oleh kemajuan zaman. Cerita rakyat bahasa inggris dapat dijadikan sebagai salah satu cara untuk mengenalkan budaya lokal kepada dunia internasional. Indonesia memiliki banyak cerita rakyat dengan cirri khas masing-masing yang tersebar dari Sabang sampai Merauke. semoga Melalui cerita semangka emas dalam bahasa inggris ini, kita bisa mengajarkan pesan moral kepada generasi penerus dengan cara yang lebih menarik .